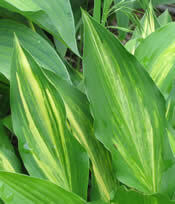 When you read Hosta descriptions you will sometimes come across one that is described as "streaked" and "unstable". Most of the commonly available variegated Hostas show a different color around the edge of the leaves (marginal variegated) or in the center of the leaves (medio variegated). Streaked Hostas have streaks of color in a random pattern throughout the entire leaf and not just in the center or around the edge like most hostas. Every leaf of a streaked Hosta is different from the next and from one year to the next a streaked Hosta can look completely different. Streaked Hostas do not behave like typical Hostas. 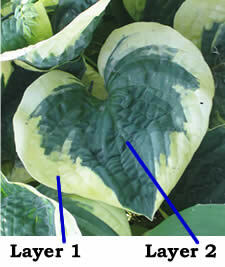 Hostas in general are quite unstable compared to most plants, but streaked Hostas are especially unstable. Hosta leaves are composed of two layers of tissue - the layer around the edge of the leaf and the layer in the center of the leaf. 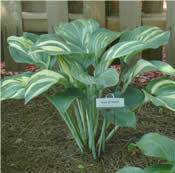 Each layer can be a different color, resulting in the typical margined or medio variegated Hostas. In streaked Hostas, these two layers are mixed together to make streaks in the leaf. The two layers of tissue are a little like oil and water - when they are mixed together (as in a streaked plant), the two different tissues try to separate or group together with their own kind to form a more stable margined or medio variegated Hosta. Without proper care, unstable, streaked Hostas will eventually stabilize into either a solid colored plant or an edge or center variegated plant. Stabilized divisions should be removed regularly to maintain streaking. The standard procedure is to dig the plant and divide out the non-streaked divisions. This is the most reliable method of removing stable divisions. The drawback is that digging and dividing is stressful for the plant and will set the plant back in both size and maturity. Others do not dig the plant, but just grasp the base of the stable division and give it a sharp twist and firm pull. The division will usually break of at the ground. The obvious benefit to this method is the minimal disturbance to the plant. The streaked part of the Hosta is not set back and will continue to grow. The down side is that some stabilized crown tissue may remain. 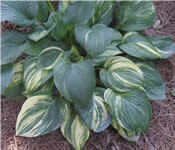 How often streaked Hostas will need to be divided to maintain their streaks depends on the variety. Some streaked Hostas have a tendency to stabilize very quickly. These especially volatile Hostas may need divided every year. Other plants are slower to stabilize and may not require any maintenance for several years. I've also observed that cultural conditions may influence how quickly a streaked Hosta stabilizes. Conditions that slow growth (dry soil, deep shade) seem to help maintain streakiness. On the other hand, conditions that promote good growth (moist, fertile soil and bright light) often will speed up the process of stabilizing. Why are Streaked Hostas so Expensive? Do to the unstable nature of streaked Hostas, it should come as no surprise that they often carry a larger price tag than many Hostas. Even though a streaked Hosta may multiply as quickly as any other Hosta, not every division in the clump will be a true to type, streaked division. Building up stock of a streaked Hosta is a slow and labor intensive process. Because of this alone, few nurseries find it feasible to grow them. Even in today's world of high tech tissue culture propagation, streaked Hostas still command higher prices. Streaked Hostas are not easily propagated via tissue culture. Their unstable nature results in very high cull rates, so even the few streaked Hostas that are tissue cultured are only produced for a short time and in limited numbers. Aside from being beautiful and unusual - though high maintenance - collector plants, the real value of streaked Hostas is in their genetics. 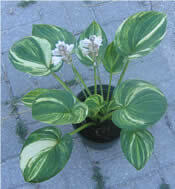 Streaked Hostas are the only reliable way to grow variegated seedlings. Occasionally a variegated seedling will arise from a non-streaked plant, but seed collected from solid colored and marginal or medio variegated Hostas normally only results in solid colored seedlings. Seed collected from streaked Hostas usually will result in a percentage of streaked seedlings. The vast majority of streaked Hostas are very unstable. However, there are a select few varieties that reliably remain streaked with little or no special care. The streaks in these stable streaked Hostas are usually more uniform and more evenly distributed across the entire leaf than typical streaked Hosta. The coloration is generally more subdued in these plants, too. What makes these few Hostas stable is unknown, but the difference also affects the seedlings from these plants. Stable streaked Hostas usually produce a very low percentage of streaked seedlings, if any, and are of little interest to hybridizers who are hybridizing for variegation. These special streaked Hostas are much easier to propagate in tissue culture, so are usually available cheaper than most streaked Hostas.